An exam board has been using administrative staff to help mark this summer's GCSE papers. Edexcel said graduate staff, some of whom work in secretarial posts, had carried out "secondary marking", or checking, of religious studies scripts. The National Union of Teachers said it was "not reasonable" for people who were not qualified teachers to be used. Edexcel and most other exam boards publish their GCSE results on Thursday. Last year's pass rate was 97.6%. The Guardian quotes a senior examiner as saying the practice of using non-teaching staff to mark scripts is widespread. "I'm concerned for the candidates who sat these papers and really I'm outraged that it's being done in a secretive manner. "It's the first time in 20 years I've heard of clerical staff being drafted in to mark papers." An Edexcel spokeswoman told BBC News that only answers to simple questions, sent to examiners electronically, underwent secondary marking by non-teachers. One example was the question, worth two marks, "What are miracles?". Others were "What is prayer?" and "Define 'disciples'". These had narrowly defined answers, containing two or three key words. Usually graduates with a relevant degree were used, in this case in religious studies. The Edexcel spokeswoman said: "I wish we had enough fully qualified religious studies teachers to mark all the papers and second mark them. "Unfortunately that is not the case, but we are maintaining standards." But the director of education at the National Union of Teachers, John Bangs, raised concerns that this could mean a "slippery road" for exams. He said he feared syllabuses being narrowed because of a lack of questions which could be marked adequately by available staff. Mr Bangs added, however, that he was confident Edexcel was maintaining high standards of accuracy in its marking. Religious studies is an increasingly popular subject at GCSE and at A-level. 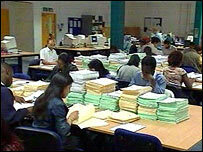 Last year, the number of entries at GCSE increased to 141,037 from 132,304 in 2003. The pass rate went from 96.5% to 97.5%, with 9.4% of candidates getting the top A* grade. In the A-level results for this year, released last week, religious studies saw the biggest increase in popularity. Entries were up on last year by 16.9%, to 16,859. I am concerned with this issue as I was a candidate for those examinations and am expecting my results on Thursday. These people obviously won't know what they are doing, which is unfair to people like me who won't be rewarded to the best of their ability. I think this is absolutely ridiculous. Not only are schools forced to fork out huge sums of money to pay for entering students into exams but they are also discouraged from having papers re-marked because of the ridiculously high fee and the assurance that they are marked by experienced and qualified examination staff. All this for Edexcel to turn around and say "we're using non-qualified admin staff to mark exams", exams which shape a persons life. I think it's time the government seriously reconsidered who it allows to carry out examinations and how they are regulated. Look at the other end of the pipeline. Our kids are seriously over-examined, and I predict that we're bequeathing some serious mental health problems to the next generation. The solution is obvious: give them back their childhood, and the chance to mature without the constant pressure of exams. Hey presto, the "shortage of examiners problem" will disappear too. If these people have suitable qualifications and are following a set scheme, what's the problem? Need to be a teacher? But they're not teaching are they? Simply checking answers. I don't have a problem with graduates marking papers. A person with a relevant degree is likely to have as sufficient a knowledge as one with a teaching degree, especially in RE, which is not always taught by qualified RE specialists. The only problem I see is people who wish to gain an A-level in religious studies for employment purposes. It's as much use as general studies. My son missed out on his firm choice for university by a fraction. He was forecast an A after his AS results, and all the signs were pointing to an A for A2. He was a handful of marks short and missed out on a place at Bristol. I would like to be more confident in the standards of marking. It can and does make a big difference to some people. I agree that this method is not entirely suitable. What is wrong with having pupils completing the exams on computers? It would be possible to restrict the computer's access to prevent cheating etc, plus invigilators could watch over the pupils while they are completing the exam. The exam could then be marked electronically, with problematic exam "papers" that could be checked manually. It's just like "out-sourcing" work to call centres in India, where the labour source is plentiful - and cheap. You can pay admin staff a national minimum wage, but you won't get a qualified teacher to mark work (during their hard-earned holiday period) for anything less that £15 an hour. With questions such as "What are miracles? ", "What is prayer?" and "Define 'disciples'" testing the intelligence of GCSE students, I am sure Edexcel would do well to employ the services of my five-year-old son. He could do an able job and is a much cheaper proposition. He can be kept happy with daily rations of McDonalds and KFC and will never go off sick for fear of missing out on these treats. I see nothing wrong with using graduate administration staff to mark simple questions with a narrow range of answers. A GCSE examination question in any subject is unlikely to be so probing that a graduate could not determine whether the answer was correct or not. Why would these graduates need to be qualified teachers to do these "marking" jobs adequately? They are not being asked to teach. Surely a teacher's time is better spent teaching? It is outrageous that non-subject specialists should be marking exam papers. And the Edexcel spokeswoman was clearly not a religious studies graduate. (How many admin staff have religious studies degrees anyway?) The three questions given as examples of questions marked by admin staff are open questions designed to test a student's understanding of the issue. They are not questions with narrowly defined answers. To give marks on the basis of such narrowly prescribed criteria is not measuring knowledge and understanding, rather it is limiting religious education to a set of key words. But key words may or may not be used in the correct context. A non-specialist wouldn't know the difference. Would they know the difference between prayer in Buddhism and Christianity, for example? Exam papers should all be marked by subject specialists and teachers should be paid more than the pittance they currently receive. Yet another example of religious studies being treated like a second-class subject. The outcry would be bigger if it were maths, science or English. At a time when religious understanding should be at the forefront of education, it is still not a priority. Of course the possible answers are going to be "narrowed" without competent markers. Where is the richness, diversity and lateral thinking going to come from if answers must contain set words? My daughter has to use "key" words set in the syllabus to pass exams, so where is the choice we promise our children? My husband, a physicist, had a good laugh at some of the "key" words required in the GCSE physics - but my daughter lost marks until she used them. Talk about brainwashing.